Did You Find the Right Web Site? Welcome to the Public Reports portal. 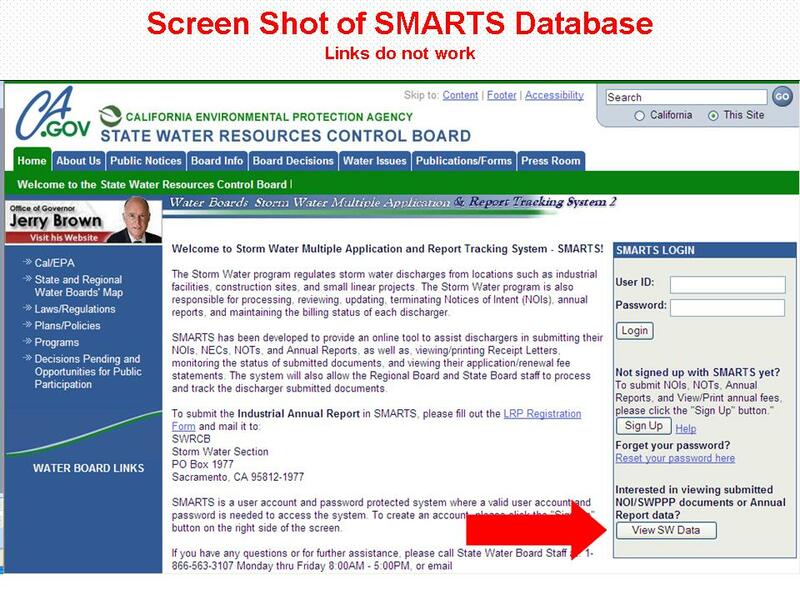 Below are links to a variety of reports that pull data from the Water Boards’ CIWQS and SMARTS databases. The data is refreshed nightly. Each link contains a brief description of the information provided in the report. This report allows the user to select whether the first display is by county, regional board, or violation type. The user then is given options to choose program type, violation source, agency type, and date range. The user can then drill down to a listing of facilities with violations and then to more details about a particular facility’s violations, in accordance with the original criteria selected. For more information about the report and how to navigate, we have developed a Fact Sheet. This report displays a summary count of violations that have either resulted in or currently have not resulted in enforcement actions. The user can choose to search by violation occurrence date, program, and/or agency type and can then either drill down on the number that have enforcement actions to see details about those actions or on the number of those violations. For more information about the report and how to navigate, we have developed a Fact Sheet. This report displays violations that require assessment of “Mandatory Minimum Penalties.” Water Code sections 13385(h) and (i) and 13385.1(a) require minimum penalties if discharges to waters of the U.S. violate certain types of permit limits. Generally, these include chronic (four within any 180 day period) effluent violations or single acute violation (an exceedence of either 20 or 40 percent of the permitted limit, depending on the constituent) of certain constituents. Additionally, monitoring reports that are more than thirty days late require a minimum penalty to be assessed. For more information about MMPs, see page 28 of the Enforcement Policy. For more information about the report and how to navigate, we have developed a Fact Sheet. This report displays the details of the submitted and certified electronic reports. This includes analytical and calculated data and attached documents. Use the various search criteria to find the eSMR of interest and click on the Report Name link to view the information submitted in the eSMR. Users can view more information about the Facility by clicking on the Facility Name link, which opens the Facility At-A-Glance report or about the Agency by clicking on the Agency Name link, which opens the Party At-A-Glance report. This report provides analytical and calculated data provided by NPDES permit holders. The report allows the user to query by a specific facility, agency, or order, or more generally by report type, monitoring location type, or time frame. The data is provided in Microsoft Excel format. The report limits queries to 100,000 data points. For more information about the eSMR Program, see the CIWQS - NPDES page. This report shows the current status and disposition of Administrative Civil Liabilities (ACLs), which are monetary penalties imposed by the Water Boards. Portions of these penalties may be satisfied through completion of certain projects in lieu of penalty payment. Active - The ACL still has penalty amounts and/or projects that have not been completed. Historical - The ACL has been paid and/or all projects have been completed. Withdrawn - An ACL was proposed but has been withdrawn. This may be because this action was replaced by another enforcement action, or because the facts did not support further pursuing the proposed penalty action at this time. This drill down report displays a table of enforcement action types per regional board. The user can control the primary sorting of the lists as well as drill down to see more detailed information. This is a report of the formal Enforcement Actions with links to the Board Orders. This report allows the user to search for a list of enforcement actions that have a Supplemental Environmental Project (SEP) and/or a Compliance Project (CP). The user can drill to details about those projects including their monetary amount and status. This report allows users to view a wide range of information regarding a specific facility on one screen. This includes owner, violations, inspections, and orders and other regulatory measures issued to a facility. For more information about the report and how to navigate, we have developed a Fact Sheet. This report allows the user to display information by city, county, or region. The user can select a program, agency type, and permit status. They are then shown a summary table based on their criteria, which enables them to drill down for more information. Sanitary sewer system agencies covered under Statewide General Waste Discharge Requirements for Sanitary Sewer Systems (WQO No. 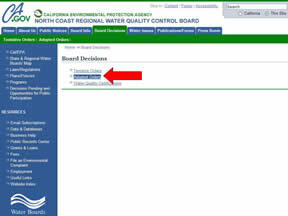 2006-0003-DWQ), referred to as Enrollees, are required to report all SSOs for which their agency has responsibility into the State Water Resources Control Board’s SSO database. Enrollees are also able to report sewage discharges from privately owned laterals or collection systems, for which the Enrollee has knowledge of the event but is not responsible, on a voluntary basis. These discharges are known as private lateral sewage discharges (PLSDs) and are separate from SSOs. Only Enrollees are allowed to submit and modify the information associated with their sanitary sewer system in the SSO database. Please visit the SSO Program Web Page for additional information on SSO reporting and the State Water Board’s regulatory efforts to reduce the numbers and volumes of SSOs statewide. These interactive geographic information system (GIS) maps, updated nightly, plot all certified sanitary sewer overflows (SSOs) and Private Lateral Sewage Discharges from sanitary sewer collection systems (not including any spills from wastewater (sewage) treatment plants), reported by agencies into the state’s online California Integrated Water Quality System. This includes the spill location, amount, source, and name of the responsible or reporting agency. A second map allows users to see Private Lateral Sewage Discharges, voluntarily reported from enrollees in the program from pipes which empty into public sewer collection systems. Private lateral spills are caused from failures in pipes that tie private businesses and homes into the public sewer collection system, and are maintained by individual property owners. They often suffer from overflows which can affect public sewer collection systems. Looking for the Status of an NOI (Notice of Intent)? Facility At-A-Glance Report – You do not need to log in. This report shows details about a Water Board General Order and its enrollees. User-specified criteria return a list of General Orders with counts of active and total enrollees. The counts are hyperlinks take the user to the details about the enrollees. NPDES Permits regulate discharges to surface water and expire up to five years from the date of adoption; however, the permits can be administratively extended during the interim period between the original expiration date and the issuance of a new permit. This report allows the user to choose the Region, County, or City and displays a list of facilities and associated information that were schedule to expire before the date the report is run but that have the status “active” in the database. This occurs when a permit has been administratively extended and is up for renewal. This Excel spreadsheet lists NPDES permits, including storm water general permit enrollees that are active or have been active within the past three years. The facility and discharger addresses are also provided. Please note there can be multiple listings for a single permit due to multiple dischargers, multiple facilities, and/or multiple address listings. Because the Regulatory Measure ID (column E) is a unique identifier for each permit, this number can be used to evaluate whether a particular permit is listed more than once. User-specified search criteria return a list of potential matches of organization names. The user can select the organization (party) he/she is interested in and drill down to a snapshot of the party’s related places, regulatory measures, violations, enforcement actions, and regulatory measures linked to related parties. This report contains data from both CIWQS and SMARTS. Looking for a Board Order? 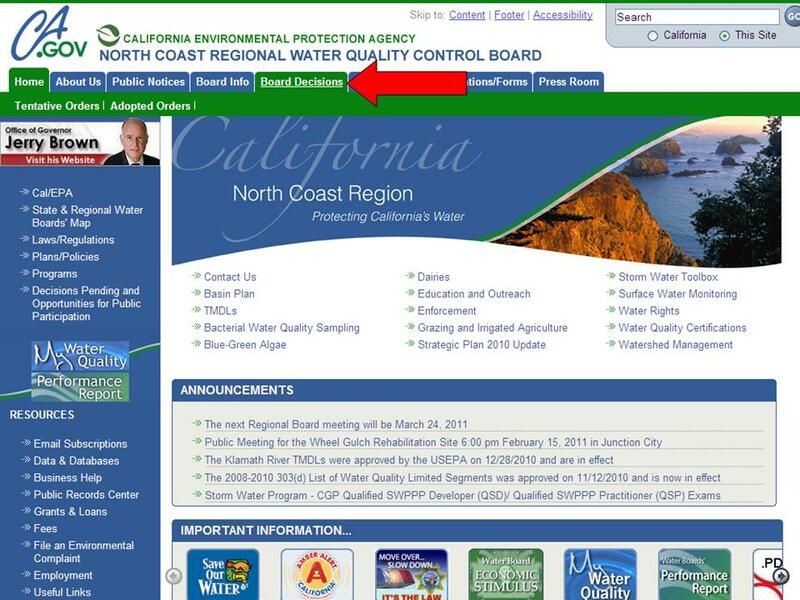 Navigate to the applicable Regional Water Board's web site. Choose the Applicable Board from the drop-down window. Click on the "Board Decisions" tab at the top. Click on the link that references "Adopted Orders"
Note: For Enforcement Orders throughout the state, refer to the "Enforcement Order Reports" section, above. Not Familiar with a Term? Glossary of Terms - Some of our reports contain abbreviations and terms that may be unfamiliar. They are spelled out and defined here. We are continuing our efforts to improve the quality of our reports. This includes providing key definitions in the reports themselves. However, if you find a term that isn’t defined in one of the reports, please refer to our glossary. Have Concerns that the Data in the Report is Incorrect? If you believe that there is erroneous information in any of the reports, please email the CIWQS Help Center. Be sure to include what report you are concerned about, a description of the problem, and the search criteria used, if appropriate. Did You Find the Website You Are Looking For? Do You Need to Submit a Spill / No Spill Report? Do You Need to Submit an Electronic Self-Monitoring Report (eSMR)? Do You Need to Submit a Storm Water Annual Report? Do You Need Permit, Compliance, and Enforcement Data about our Regulated Agencies from the CIWQS and Smarts Databases? Refer to the Quick Links at the top of this web page.